"You're just one good web sales letter away from a million dollars"
Famous copywriter Ted Nicholas (who has made many millions of dollars) didn't say "*web* sales letter." The Internet didn't exist when he started making his direct marketing millions. Are you driving traffic to your site but failing to make sales? Paying more for your ads, banners and pay per click engine placements than you're making? Despite what you've read, the 3 keys to Internet success are NOT "traffic, traffic and traffic." They're NOT even "targeted traffic, targeted traffic and targeted traffic. The ONE key to mining the Internet gold mine is "targeted traffic converted to sales." That's what this book teaches you -- the pieces of web sales letters plus the principles that make them work. As you'll see, a lot is common sense. Not rocket science or brain surgery. You learn by example - taught by many of the greatest web copywriters online today. I'll let you in on a deep secret -- none of these success stories was BORN a good web sales copywriter! What's made the big difference in their lives is that sometime between that birth and the beginning of their online wealth they studied GOOD copywriting. Then they tested their efforts in the marketplace and tested and changed what still didn't work. Some of the greats included in Web Sales Letters Supreme were professional copywriters before they started their online careers. But many started their online businesses first and learned copywriting because they had to. Many of them are NOT professional copywriters. They started out as a doctor, a pizza delivery dude, a Kinko's clerk, a reporter . . . all self-educated, self-trained copywriters. 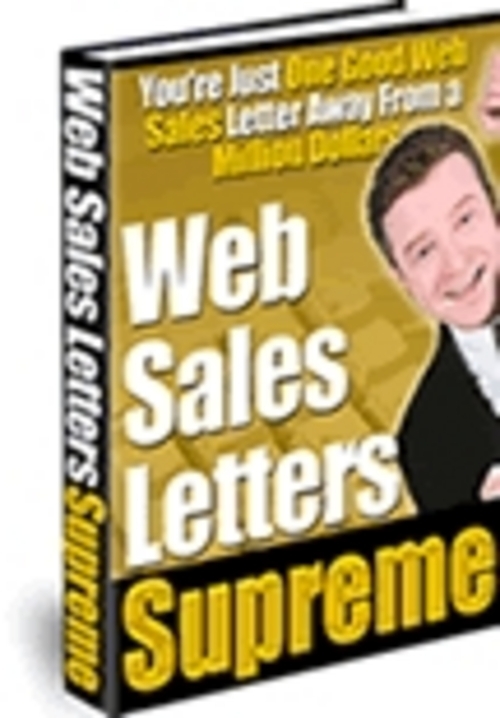 Easy to understand explanations of the 8 main parts of a web sales letter supreme. Once you know the structure, you can piece together an acceptable letter. The 3 Ps that are the foundation of a successful web sales letter. You must understand these before you start thinking about the mechanical parts of a web sales letter. They're not hard, and they're basic. 1. Some of the letters are quite old. Is the venerable headline "Do You Make These Mistakes in English?" inspiring for copywriters aiming for modern Internet customers? You should also notice that the retail price is $79.95. Amazon's price is $55.96 plus postage and handling. That's three times more than you'll pay for Web Sales Letters Supreme. You can also learn copywriting by attending one of Randy's copywriting bootcamps. Last time I received a mailing for one, the price for one week's training was only $5000. That's how much aspiring direct mail copywriters value that skill. Cost savings and anthrax are forcing many small and large businesses to substitute web sites for direct mailings. I don't know what your profit margin is, and since your investment in Web Sales Letters Supreme is only $14.95, most of you would more than make back the price of this book with only ONE extra sale. So if you make more than one sale that you wouldn't have made otherwise, Web Sales Letters Supreme is a worthwhile investment. That's right. Once you own Web Sales Letters Supreme you not only own your personal copy - you own the right to sell it, give it away or distribute in any way you see fit except spamming. You can charge the same $14.95 I charge or more or less. That's it. Don't spam. Don't change it in any way. The only difference between you and the people who write web sales letters for others is that they have learned their craft. Plus, they have some experience. You won't start out making $1000s per sales letters as the top professionals do, but you'll find that when you know how to create web sales letters that move products, businesses will pay handsomely for your services. I'm so sure that the 37 web sales letters in this book can teach you how to write effective web sales letters that I'll make this more than fair guarantee. You have one year to read, study and apply what you've learned from Web Sales Letters Supreme. If you don't make back at least 10 times your investment -- $149.50 -- I'll refund the money. If you read, study and apply the lessons you learn from the proven web sales letters in this book, you cannot help but make that $149.50 -- unless you're already a great copywriter who already knows everything that Mark Joyner, Dr. Ken Evoy, Yanik Silver and all the others do. If so, my hat's sure off to you! What if you still think you can't write an effective web sales letters yourself? So you plan to hire out that task? You still want to learn to recognize a good letter when you see it. Your customers will have the final word about whether any given web sales letter is effective or not, but you can and should be able to recognize weak headlines and letters. Not all web copywriters are equal so you want to study the best work so you can recognize it when you see it -- and recognize when a letter needs improvement before you test it. Besides, hired copywriters can't do everything for you. They don't know your product or your business as well as you do. They'll still need you to tell them how your product benefits customers. They'll still need you to decide on the price, what bonuses to give away and what your guarantee is. Also, skilled copywriters don't come cheap. One good web sales letters will cost you hundreds or thousands of dollars. *HOT! *Unique of 37 Proven, Successful Sales Letters download ebook;home business;how to;tips 91680328 8.97 rapidscc Fresh Download Available!